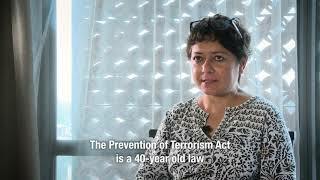 (Geneva, January 29, 2018) – The Sri Lankan government has failed to fulfill its pledges to abolish the abusive Prevention of Terrorism Act (PTA), Human Rights Watch said in a report released today. For decades, the PTA has been used to arbitrarily detain suspects for months and often years without charge or trial, facilitating torture, and other abuse. "The Sri Lankan government has been all talk and no action on repealing the reviled PTA," said Brad Adams, Asia director at Human Rights Watch. "Replacing this draconian counterterrorism law with one that meets international standards should be an urgent priority if the government is serious about protecting human rights. "The 46-page report, "Locked Up Without Evidence: Abuses under Sri Lanka's Prevention of Terrorism Act," documents previous and ongoing abuses committed under the PTA, including torture and sexual abuse, forced confessions, and systematic denials of due process. Drawing on interviews with former detainees, family members, and lawyers working on PTA cases, Human Rights Watch found that the PTA is a significant contributing factor toward the persistence of torture in Sri Lanka. The 17 accounts documented in the report represent only a tiny fraction of PTA cases overall, but they underscore the law's draconian nature and abusive implementation.